Watered down for family viewing, this Brothers Grimm musical mashup sails a sea of mediocrity for two hours leaving you feeling that something is most definitely missing. It’s a strange feeling to go into a Disney film with lowered expectations. It’s a weird mind-set to have knowing that the last few musicals you sat through knocked out any hope that you might ever enjoy one again. But hey, I grew up on old school Disney animation and can still to this day reel off the lyrics to all the songs in The Jungle Book and Aladdin. So if any film was going to restore my faith in family films I can sing along to with the kids like we used to back in the day, it’s got to be Disney, right? Sadly, I don’t think this is the movie my childhood needed it to be. I confess, until very recently, I had no idea what Into the Woods was. I hadn’t heard of the stage production and I had absolutely no idea that it was almost 30 years old. When I did get through a detailed synopsis and understood the concept, my initial reaction was surprise. Not that it was being adapted to film, but that it hadn’t been done twenty years ago. Upon continued reading, I thought I discovered the reason for the film’s existence. The story has some quite dark themes. Themes that have been touched upon in a lot of the Grimm fairy tales, but that have never really come to life in the countless animated movies Disney have given us. With the recent success of Maleficent, a film with some very dark undertones, I thought I could see what was coming and I got quite excited about seeing more of the same from Disney’s latest. Adapted for the screen by Stephen Sondheim and James Lapine, the creators of the stage show and its music, Into The Woods is the story of a baker and his wife (James Cordon and Emily Blunt) who are desperately trying for a family. Forced to take on a quest to search out items that an evil witch (Meryl Streep) needs for a spell. In exchange for these seemingly benign objects, the witch will remove the curse she herself placed on them to prevent them having kids. A spell she cooked up in revenge of the baker’s father stealing her magic beans. Seems reasonable to me. You steal my rubbish beans, I curse all your children to an eternity of Brewer’s droop. A good, proportionate response, right? Anyways. These items are the start of the recipe for a melting pot of fairy tales that plays out almost exactly as you would expect them to. The very good Emily Blunt and the pretty pants James Corden set off into the woods in search of a cow, a red cape, a slipper and a lock of blonde hair, inserting themselves into all your favourite kids’ stories to steal stuff and get in the way. Judging from its genre descriptions on IMDb, I’m almost positive that it’s here that hilarity is supposed to ensue. What follows is a couple of hours of story with no real direction. Rob Marshall (the guy that made the very good Chicago, the boring Nine and the bland Pirates of the Caribbean 4) doesn’t seem to know where to go with each scene. Having not seen the stage production, I can only assume that this is how it plays out on Broadway, but it just seems aimless. Jack gets his beanstalk in lightning quick time but it takes Cinderella three days to lose her shoe. Red Riding Hood takes seconds to play out her story with the Wolf and we either have a massive decade long gap between scenes or Rapunzel is soaking her head in Miracle-Gro at night. It’s just all over the shop. Each scene comes with a new song and a new reason to roll your eyes. Aside from a couple of the musical numbers, none are delivered with any heart or passion. It’s difficult to describe what feels so wrong with the delivery considering the very point of a musical is to sing the script, but it just feels like the music has been shoehorned in and none of the cast are happy about it. For the most part, the acting seems just as erratic. But a few, for better or worse, deserve special mention. Meryl Streep and Emily Blunt are excellent in their roles. Streep’s wicked witch routine is sublime. Her hag filmography is starting to fill out nicely with this and Maggie Thatcher vying for the top spot. The usually very good Anna Kendrick’s performance as Cinderella is, maybe ironically, best described as wishy-washy. She doesn’t seem like she’s having any fun in maybe the most recognisable role in the film. The film’s two princes are just embarrassing! 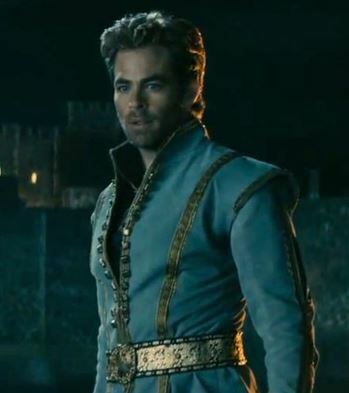 Played by Chris Pine and Billy Magnussen, they both seem to be channelling Errol Flynn, trying to swash and buckle their way through their respective tales and joining up for a very, VERY camp musical number at the top of a waterfall. Pine’s prince seems the more “Disney” of the two, if you can look past the fact that for his first five or so scenes, I thought it was James Van Der Beek with a bad accent. Nope, it turns out it was Captain Kirk, with a bad accent. But the relatively unknown (at least, to me) Billy Magnussen’s prince is completely out of place. Several of his key scenes have a slapstick element to it which while I expected a comedy, felt like I would find them as deleted scenes on the Robin Hood: Men in Tights DVD. Finally, Disney have carried on their tradition of trying to sell you everything by having an appearance from Johnny Depp in a silly hat! You’d be forgiven for going in expecting more than the five minutes screen time he gets, but in those few minutes he does a spectacular job of proving that he’s become a real one trick pony. Looking like he’s just tripped and stumbled onto the set while he was on a smoke break from the latest Tim Burton film he’s in, Depp overacts his role as the Wolf clearly in the hope that one day there will be an Oscar for cameos! Rob Marshall clearly set out with good intentions, and I have to believe that if the creators behind the original show were involved in its adaptation then at least a token show of intent was made to bring all the story’s themes across from the stage. The problem is, in an attempt to sell us a family friendly fantasy, Disney have diluted the second half of the film. Maleficent this ain’t. It’s not even that they appear to have changed things, I just got the feeling that large chunks of story have simply been removed. A whole lot of build-up sadly gives way to a rushed second half and an unsatisfying ending with none of the cautionary tale that I knew should have been there. Overall, as far as films go, as far as musicals go, even as far as Disney adaptations go, it’s just there. Not as good as Chicago, not as pretentious as Les Miserables and not as crap as Sweeney Todd. It’s just forgettable, inoffensive, uninspired guff. Into The Woods is in cinemas this weekend. Tune in to our next podcast to here Andrew make his debut and chat about Disney’s latest musical with the rest of the gang. Good review Andrew. Its song and dance numbers were actually pretty fun in the first-half. However, when everything got a lot darker and serious in the later-act, it still worked.